In February 1300, Enrico Scrovegni, a Paduan businessman and banker, purchased the site of an old Roman amphitheatre in his home city. Over the next three years he financed the construction of a chapel, ostensibly for the private use of his family, which he named after Santa Maria della Carità, that is, to Mary, mother of Jesus, Saint of Charity, who intercedes for sinners and pleads for their salvation. The Chapel was dedicated in 1305, by which time Scrovegni had travelled to Rome to see Pope Benedict XI, who agreed to grant indulgences to visitors to the Chapel. In addition, since the local celebration of the Feast of the Annunciation was held nearby, the Chapel was opened to pilgrims and worshippers at this time each year. To decorate the interior of the Arena Chapel, Scrovegni chose Giotto, already recognised as one of the greatest artists of his day: in the words of Dante, "But after Cimabue was the rage/Make way for Giotto, hard upon his heels/To dim his fame." Some historians think Giotto might also have been the Chapel's architect. His extensive frescos - which tell the story of Mary's birth as well as Christ's birth, life and death, and which remind viewers of the day of judgement to come – are widely considered to be one of the great achievements of trecento Italian painting. For a man whose family wealth came from money-lending – Dante's reference to Enrico Scrovegni's father in The Divine Comedy was considerably less complimentary than his reference to Giotto - the Arena Chapel building project was a great success. Scrovegni had secured the agreement of the local political authorities to build a large, spectacularly decorated church, in which his family name was prominent, and in which he had arranged the setting for his family tomb. The Third Lateran Council (1179) had prescribed the excommunication of manifest usurers and denied them Christian burial, yet Enrico had been granted papal blessing for his extravagant and beautifully frescoed burial plot. From its inception, the Chapel was both a private and public building of great significance. Not everyone in Padua was happy. Local friars objected that the Arena Chapel was excessive: Scrovegni "should not have built a large church there, and the many other things which were done there, more for pomp, vain glory and income than for the praise, glory and honour of God." Later, shortly after Scrovegni's death in 1336, a Paduan chronicler recorded the story of his trip to Rome, suggesting that he secured forgiveness from the Pope for the family's history of usury in return for favours: sic omnia per pecuniam facto sunt [thus all things are accomplished through money]. Today, Scrovegni is largely forgotten, yet his Chapel remains. Giotto's standing in Western art is assured, thanks in part to his work paid for by Scrovegni's money. Nearly two hundred years later - and two hundred kilometres to the south – Girolamo Savonarola lectured the artists of the time from his Florentine pulpit: "You painters do ill; you introduce worldly vanities into the Church. If you knew of the wrath you incur in doing so, you would act differently." He also attacked those who spent lavishly on luxury goods while neglecting to care for the poor. These wealthy patrons were accused of collecting and displaying lascivious books and images in their houses and filling the churches with paintings full of gratuitous content: family members in the guise of saints or as witnesses to the life of Christ. Savonarola led a popular movement that took an increasingly hostile approach to luxury and pleasure. His followers were encouraged – especially around Shrove Tuesday and other feast days – to confiscate playing cards, to admonish women for wearing ostentatious clothing, and men for blaspheming. In February 1497 and again in February 1498, Savonarola organised a "bonfire of the vanities", demanding that books, paintings, clothes, jewels and ornaments be brought to the Piazza della Signoria, where a pyramid of expensive art objects, fifteen metres high, was consigned to flames. This religious assault on the humanist culture of quattrocento Florence is beautifully reconstructed in George Eliot's novel Romola. Three months later, in May 1498, it was Savonarola's body that was publicly burned, after he had been arrested, tortured, tried and executed. An account of his death was published in 1503 by Simone Filipepi, one of the Piagnoni [weeping ones] - the disciples of Savonarola - and the brother of Sandro Botticelli, the leading Florentine artist of the day. Some of Botticelli's work of that time - for example, the Mystic Crucifixion - reflects the influence of Savonarola's teachings, but mostly to the detriment of his earlier achievement, which was, in the words of Walter Pater, "the result of blending in him of a sympathy for humanity in its uncertain condition, its attractiveness, its investiture at rarer moments in a character of loveliness and energy, with his consciousness upon it of the great things from which it shrinks, and that this conveys into his work somewhat more than painting usually attains of the true complexion of humanity." Savonarola's preaching had an impact on the quantity of art produced in Florence as well as the quality. From 1494, there was a decline in commissions – both by individual donors and civic authorities – which did not reverse until the early 1500s. To the extent that the Renaissance was a consumption phenomenon - both in private households and in public spaces - and since at that time accumulations of wealth were greater in Northern Italy than elsewhere in Europe, it is apparent that Savonarola's campaign against luxury achieved at least a temporary success in restraining the vigour of European culture at its Florentine epicentre. Botticelli was around fifty at the start of this lean decade and he produced little work after 1505, before his death in 1510. He was, by then, well established as one the central figures in Renaissance art, not only for his altarpieces and religious paintings, but for his many portraits and his celebrated mythological paintings of Venus, Camilla and Primavera. 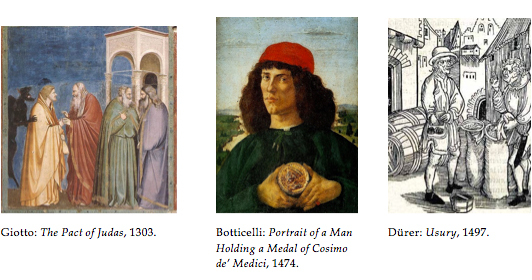 Despite Savonarola, Botticelli's place in art history was secure: many of the worldly and other-worldly art works he had made survived the friar's bonfires. Savonarola's sermons were, however, regularly republished in the century after his death, including by Martin Luther. These two shared a commitment to the disciplined Christian life, a suspicion of commercial activity and the wealth it generated, and a strong dislike of the papacy. Luther, however, was willing to challenge church dogma in a way that Savonarola never did: Wittenberg was much further from Rome than Florence, geographically and doctrinally. In 1517, German churches were, just like Italian churches, full of art. One of the significant legacies of Medieval Europe was the "sensuous perception of the sacred". Luther, and the other major figures of the Reformation, preferred words to images: books were better than pictures, but best of all were sermons. Images were acceptable to Luther so long as they were educational, reinforcing the message of the New Testament and helping those who were not educated to understand better the stories of the Gospels. He was less enamoured of decoration for its own sake: the proximate cause of his rebellion against Rome was the sale of indulgences in Germany to fund the restoration of St Peter's basilica. Few artists would have shared Luther's didacticism, wholly rejecting the ornamental and expressive functions of art and replacing them with a purely pedagogical role. Nonetheless, the leading German artists of the day – in particular, Albrecht Dürer and Lucas Cranach the elder - supported Luther's reforms and made art that reinforced his message. 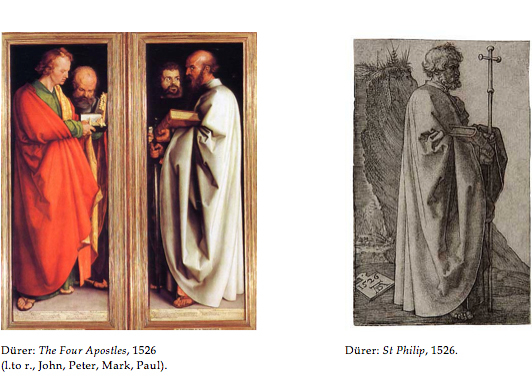 For example, in Dürer's late painting, The Four Apostles, the figure of Peter (the founder of the church in Rome and, therefore, of the papacy) is moved to the background to give precedence to John and Paul, the New Testament writers whom Luther most admired. The question of what to do with the artworks that filled the churches was much debated among the Reformers. Karlstadt and Zwingli argued that all images should be removed from churches and destroyed. Luther supported the removal of some objects, although he thought the authorities should take responsibility for this action and he was critical of riots which involved the smashing of artworks. He would have agreed with Erasmus' observation about the night in Basel in February 1529, in which the city's churches were emptied of all their artworks by the mob, that "they had done nothing for piety and much for sedition." Iconoclasm was stronger in Zurich and Basel than in Nuremberg or Wittenberg, whereas art production had been greater in Nuremberg. The civic authorities were generally willing to allow donors to remove objects they had paid for from the churches, not least because many of the donors would have held civic office themselves; but they worried about popular unrest, and the need to maintain order at a time when zeal for reform was widespread. Many German art works were preserved, but in Zurich no statues and perhaps only a tenth of paintings from the Medieval period now survive. Art work production declined in Germany after the 1520s and, unlike Florence, it did not recover for many decades. When Holbein left Basel for England in 1526, his letter of recommendation from Erasmus said: "Here the arts are cold, he goes to England … to scrape together a few angelots." However, the Reformation stimulated publishing: Bibles, devotional manuscripts and copies of sermons were widely distributed, which created work for engravers and woodblock printers. Dürer made engravings and woodcuts: these printing techniques, which allowed for multiple copies on paper that could be transported more easily and cheaply than paintings and altarpieces, were good for business. The temporal and geographic distance between sender and receiver also allowed for greater interpretative possibilities, a clear advantage in an age when the purpose and meaning of artworks were so strongly disputed. A good, late example of Dürer's work is his engraving of St Philip (1526), which blends technical virtuosity with ambiguity of message. Despite the two centuries that separate the frescoes of Giotto from the paintings of Botticelli and the prints of Dürer, all three artists operated under a similar system of patronage. Art works, literary works and chapels were sometimes paid for by the church or the civic authorities, but more often by wealthy individuals who wanted to acquire art for private pleasure or, like Scrovegni, to make a public statement. Cosimo di Medici bought many manuscripts for his own collection (he once made a bulk order of two hundred new books, to be copied within 22 months) but he also financed the meeting of the Council of Churches in Florence in 1438, which brought Greek and Byzantine scholars to Italy, along with their collections of manuscripts and knowledge of classical Greek texts. Renaissance artwork production constituted only a small part of total consumption, but it was a highly visible reminder of the level of luxury enjoyed by a small section of the community, and of the artistic brilliance that such wealth could sustain. Religious leaders – in particular, the friars – considered themselves entitled to criticise displays of luxury consumption, whether in public buildings or in private households. Sumptuary laws regulated how citizens could dress in public and how much could be spent on baptisms, weddings and funerals. 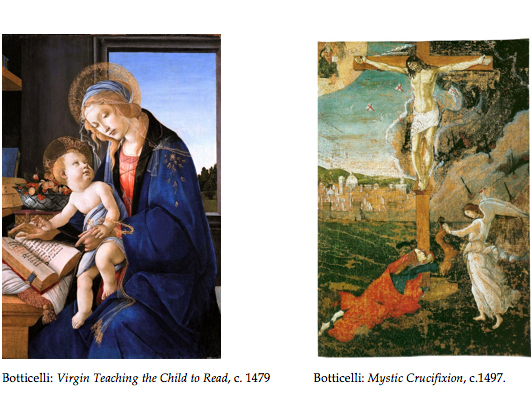 The production and use of devotional manuscripts and art works was encouraged; Botticelli built his early career though the production of Madonna and Child paintings for private use. He later became known as the painter of mythical and pagan images – according to one contemporary, he painted more beautiful female nudes than any other artist - commissioned by private wealthy individuals for devotions of a different nature. 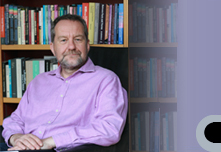 The state of the art economy was dependent on both the state and the structure of the wider economy; and from the 1300s to the 1550s both were changing significantly. The dominant economic theory was the scholastic doctrine of usury, which was an application of theology to law, and of law to economics. Although later theologians worked hard to accommodate the theory of usury to changing economic circumstances, the early Medieval theory had developed a highly restrictive set of principles. While private property was not itself part of the natural law, it was of benefit to mankind and should be respected. Voluntary exchanges of goods and services were recognised as valuable, as was legitimate profit, although the pursuit of wealth and luxury was frowned upon. However, profit from loans – "where more is asked than is given" – was considered a sin; and it was a sin of injustice rather than avarice, because it constituted the theft of another's property. Although some secular authorities might tolerate usury (and protect usurers) the church was clear that not only would usurers be held accountable on judgement day for their mortal sins, but in addition those who intended usury would also be punished, for "hope made the usurer" as lust made the adulterer. In practice, the secular authorities were primarily concerned to outlaw the clandestine practices of unlicensed (and therefore uncontrolled) lenders but were willing to provide protection to the public activities of manifest usurers, not least because many civic authorities and princes needed loans themselves to fight wars and protect their territories. The church, by contrast, and notwithstanding the comprehensiveness of its theological teachings, tended to focus its attention on the most visible, the most notorious, the most flamboyant of money-lenders. Enrico Scrovegni's family were active lenders to the Paduan authorities and to leading families of the city and were the subject of much criticism from the local friars for their usury and their ostentatious display of wealth, not least in the commissioning of Giotto's frescoes. Since a sin against justice required not just repentance, but also restitution of stolen goods, we may assume that the Pope forgave the Scrovegni family's sin and allowed the consecration of the Arena Chapel, precisely because the gift of the chapel, in honour of Mary, was an acceptable form of restitution for the "theft" that had occurred by the charging of interest for loans. Many of Giotto's other clients were similar to the Scrovegni family: his altar panel showing St Francis receiving the stigmata was probably funded by the Cinquinta family of Pisa, whose bank was one of the most successful in Italy in the duecento, and his frescoes in the Bardi and Peruzzi family chapels in Santa Croce were made for the leading banking families in Florence. Those wealthy enough to employ Giotto had mostly made their riches from trade, and most merchants of the time traded in money as well as goods and services. The most vocal proponents of the prohibition against usury combined their attacks on the sources of wealth and the uses to which it was being deployed: both patrons and artists were condemned for their complicity in ungodly behaviour. In his sermons on usury (1520) and commerce (1524), Luther attacked the financial techniques that supported the growth of trade across Europe and between Europe and the rest of the world. Providing security for loans and the charging of fixed rates of interest, were considered by Luther an intrusion into God's domain, as if the measurement and management of risk, required for the successful growth of trade, somehow constrained God's control of the future. Since Fibonacci had published Liber Abaci (1202), mathematical knowledge had been routinely applied to commercial calculation. Luther believed we should place our hope solely in God and decline to hedge our risks. Savonarola and Luther sought to detach their followers from worldly things and to focus their attention on heavenly things. Trade in necessities was welcomed, to sustain the lives of the faithful, but other consumer goods were regarded as a distraction from spiritual activities. Art was useful only insofar as it directed the viewers' attention away from this world and towards the world to come. It was better, as Luther said, to be "poor with God than to be rich with the Devil." The period from 1300 to 1550 saw much improved money supply and lower interest rates, more sophisticated trade-finance products, better transports links (both coastal shipping, trans-Alpine roads and stronger bridges), growing city populations who consumed food surpluses produced elsewhere, and an urban ruling elite who sought rare and precious goods (both locally made and imported). There was also a trade in ideas. The development of printing in the second half of the period aided the rapid dissemination of new knowledge. Savonarola was the most published Italian writer in the quattrocento and Luther arranged for large print-runs of his sermons and commentaries to be distributed in Germany. The dissemination of devotional and educational material was made possible by the same economic forces that supported growing consumption of quotidian items and exclusive art works. Luther and Savonarola lived in a time of increased trade and growing wealth. While they demanded a return to an earlier, simpler, purer Christian lifestyle, much of Europe was enjoying an upsurge in commercial activity that allowed for a richer, more complex and more acquisitive way of life. Human appetites and interests were expanding and were no longer willingly constrained by preaching. Today, no-one much cares what church leaders say about commerce or consumption; and most church leaders have – like the Renaissance papacy – adapted themselves to the benefits and comfort of modern lifestyles. The true inheritors of the friars' message of economic austerity are the fringe left-wing academics and politicians who demand a root and branch reform of capitalism with no thought about the consequences for the poorest, on whose behalf they presume to speak. There have been occasional outbursts of iconoclasm in Europe in the past hundred years – notably in Germany in the 1930s, when books were burned and "degenerate art" removed from museums - but a modern-day Savonarola would be unlikely to be able to raise a fifteen-metre bonfire in the centre of a European city. The most recent outbreak of radicalism in Zurich was not religious but artistic: Dadaism. The greater worry for artists today is self-censorship. Mostly this is a problem outside of Europe, where political and religious pressures mean that it is often not safe for artists to make and display what they would otherwise choose to do. The threats faced by these modern artists resemble more closely the organised suppression carried out in Europe by religious or state authorities during the Counter-Reformation and the Inquisition, after the 1550s, rather than the sermonising of Savonarola or Luther in the preceding century. Collecting expensive art works continues to attract the attention of the rich, although books, tapestries and precious stones have not retained their status as a source of prestige. Today, the role of the private patron has declined, while the market for collecting has grown. Far less money is allocated to commissioning living artists to make great new works, than is spent on the trophy assets of the past. Leonardo, Vincent and Andy are dead, but their price appreciation continues. Regardless of the development of techniques of mechanical reproduction, the aura of great art works has faded as European culture has become saturated by images: today paintings attract admirers rather than devotees. The museums and galleries in which great art works are now displayed continue to be supported by the banks that operate the system of capital which makes possible trade, consumption and the art market. Seven hundred years after Giotto, many things in Europe have changed, but not the central role of finance in the support of great art: all things are still accomplished through money. Armstrong, L., 2016. The Idea of a Moral Economy: Gerard of Siena on Usury, Restitution and Prescription. Toronto: University of Toronto Press. Brisman, S., 2016. Albrecht Dürer & the Epistolary Mode of Address. Chicago: Chicago University Press. Burke, P., 2014. The Italian Renaissance: Culture and Society in Italy. 3rd ed. Cambridge: Polity Press. Christensen, C., 1979. 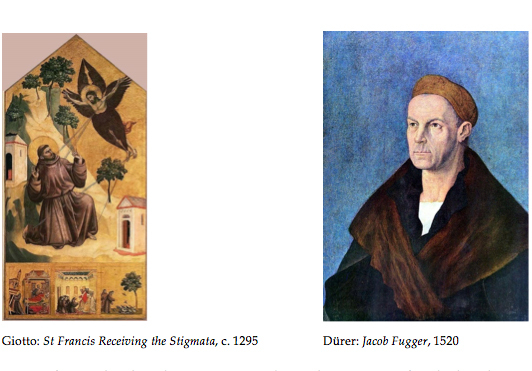 Art and the Reformation in Germany. Athens, Ohio: Ohio University Press. Dall'Aglio, S., 2010. Savonarola and Savanarolism. Toronto: Centre for Reformation and Renaissance Studies. Derbes, A. & Sandona, M., 2008. 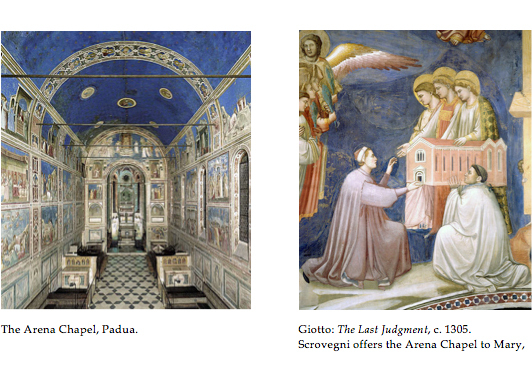 The Usurer's Heart: Giotto, Enrico Scrovegni and the Arena Chapel in Padua. University Park, PA: Pennsylvania State University Press. Eliot, G., 1996. Romola [1862-3]. London: Penguin Books. Gardner, J., 2011. Giottoe and his Publics: Three paradigms of patronage. Cambridge, Mass. : Harvard University Press. Goetzmann, W., 2005. Fibonacci and the Financial Revolution. In: W. Goetzmann & G. Rouwehorst, eds. The Origins of Value: The Financial Innovations that Created Modern Capital Markets. Oxford: Oxford University Press, pp. 123-143. Goldthwaite, R., 1993. Wealth and the Demand for Art in Italy, 1300-1600. Baltimore: John Hopkins University Press. Hall, M., 1990. Savonarola's Preaching and the Patronage of Art. In: T. Verdon & J. Henderson, eds. Christianity and the Renaissance. New York: Syracuse University Press. Jardine, L., 1996. Worldly Goods. London: Macmillan. Kohl, B., 2004. Giotto and His Lay Patrons. In: A. Derbes & M. Sandona, eds. The Cambridge Companion to Giotto. Cambridge: Cambridge University Press, pp. 176-196. Luther, M., 2015. On Commerce and Usury (1524). London: Anthem Press. Nelson, B., 1947. The Usurer and the Merchant Prince: Italian Businessmen and the Ecclesiastical Laws of Restitution, 1100-1550. The Journal of Economic History, 7(Supplement), pp. 104-122. Noonan, J., 1957. The Scholastic Analysis of Usury. Cambridge, Mass. : Harvard University Press. Panofsky, E., 1969. Erasmus and the Visual Arts. Journal of the Warburg and Courtauld Institutes, Volume 32, pp. 200-227. Pater, W., 2013. The Renaissance: Studies in Art and Poetry . London: The Folio Society. Sebregondi, L. & Parkes, T. eds., 2011. 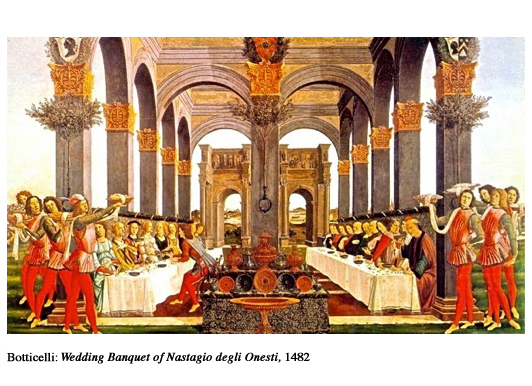 Money and Beauty: Bankers, Botticelli and the Bonfire of the Vanities. Florence, Italy: Giunti Editore, SpA. Spufford, P., 2002. Power and Profit: The Merchant in Medieval Europe. London: Thames & Hudson. Stubblebine, J., 1969. Giotto: The Arena Chapel Frescoes. London: Thames & Hudson. Zöllner, F., 2015. Sandro Botticelli. 2nd ed. Munich: Prestel Verlag.